We spend hours researching for the best dog food brands for our pet, we make sure we buy only safe puppy toys, but were you aware that water is probably the most important step to keep your dog healthy? Just like us, a dog consists of around 80% water. Water is essential for most bodily processes to keep him healthy, such as circulation, digestion, filtering waste and regulating the body temperature. If your dog is dehydrated, he can suffer terrible illness, heart and kidney damage as well as various other problems. Water is crucial for a dog’s wellbeing, to channel important nutrients throughout the body and to aid with digestion. Water also helps a dog to maintain a normal body temperature and to cool down the body. Water cushions and lubricates the joints to make it easier for your dog to move around and internal tissues and the spinal cord are shielded by moisture. Water is also essential to remove waste urine and bowel movements from the dog’s body. Basically, water is essential for almost every bodily function, and without it, your dog will become seriously ill and dehydrated. If it appears your dog is not getting sufficient water through the day, check him for signs of dehydration. These can include darkened and sunken eyes, dry gums and lethargy. There is an urgent need to get your dog to the Vets as soon as possible, where he can check your dog over and connect him to an IV line to quickly rehydrate. Ensure that the drinking water bowl is kept clean. Bacteria can quickly form on the sides and rim of the bowl and turn the water nasty quite quickly. Your dog may fall sick if he drinks from it. Ensure that he has a heavy dog bowl that cannot be knocked over. Consider the size of the bowl too, as a tall narrow water dish is good for Spaniels and Bassets that have longer ears, whereas a smaller dog may fall into a large water bowl. Always make sure that your dog’s water bowl is full throughout the day, regardless of it being summer or winter and change the water at least twice. If you’re off on a walk or a play time, take along extra water and a collapsible water bowl or drinking bowl. Dog’s mouths easily dry out through panting. Taking a car trip, make sure that you have an adequate supply of fresh water for your pet, and take plenty of breaks to allow for walks in the shade, and time for a refreshing drink of cool water. A good, clean, plentiful water supply will keep your dog cool and happy in the summer sunshine. Watermelon and berries, carrots and apples all have a high water content, so consider giving them as a treat occasionally. Put on the sprinkler attachment on your hosepipe, as most dogs love playing catch with the water, although they won’t drink much of the water, they will at least get some into their mouths, and all dogs enjoy an ice cube to entertain them, which will help to rehydrate them. Is it safe for dogs to drink outdoor water? When m walking my Client’s dogs in the Finchley area, we sometimes come across a stream or even a puddle, and quite often, the dog will begin to drink the water. In general, we need to assume that outdoor water isn’t really suitable for drinking, as it can contain chemicals, microbes and organisms that may be harmful to your pet. Ideally, I always aim to carry a water bowl and a bottle of drinking water, so that the dogs can quench their thirst. If I see a dog attempting to drink from a puddle or other source I gently steer them away using distraction techniques and offer them the fresh drinking water. If you have any questions regarding the amount of water your dog should be drinking, consult with your local vet. 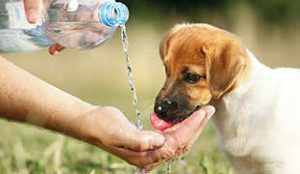 Always provide sufficient, clean, fresh drinking water for your dog, to ensure that he is happy and healthy.